In life, Adaret was a priestess of the Light in northern Lordaeron. As far as she’s concerned, she’s lived a fairly uneventful life prior to the plague of undeath. Though she attempted to find a cure for it, she was ultimately unsuccessful and succumbed to it, herself. Eventually, her body rose again as one of the Scourge, faithfully serving the Lich King until his hold over some of their number weakened. Upon regaining her faculties, she pledged herself to her newfound Queen, joined the Cult of the Forgotten Shadow, and has happily been a proud member of the Forsaken ever since. For a time, she was perfectly content to remain in the Undercity and carrying out a quiet, uneventful existence. It wasn’t until Putress and Varimathras took their precious city that Adaret gained a new found resolve. Unable to help the soldiers of the Horde reclaiming their city, Adaret vowed that, someday, she would be able to get the revenge on the Scourge and those like Putress that she so desired. Taking on the new surname “Shadowweaver”, Adaret ventured out into the world. With the true source of her anger, the Lich King, dead, Adaret has returned to the Undercity to serve both the Harbingers of War and her Dark Lady. 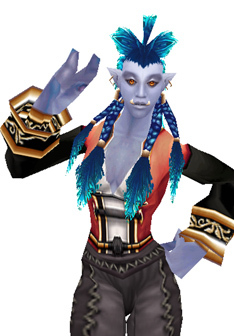 Jinaki Darkspear is a young troll really just trying to find her way in the world and has grown up as a proud member of the Horde. A new warrior and a fairly new member of a unit known as the Harbingers of War, she’s still trying to find that delicate balance between just wanting to have some fun and being a dedicated soldier. She longs for something new, something unique, and, soon, she’ll be able to venture elsewhere, to see the things she longs to see. 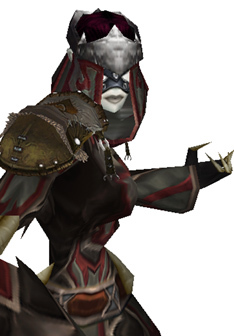 She just hopes that she’ll be able to make both her unit and the Horde proud once she gets there. A goblin shaman extraordinaire, so she says, Kadsura came to the Horde after Deathwing’s destruction of her home and being tossed around by various jungle monsters. After Thrall saved the entire Bilgewater Cartel, Kadsura pledged herself to the Horde in the hopes that someday she might be able to take on Deathwing himself and pay him back for what he did to Kezan. 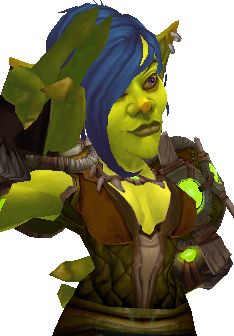 A happy soldier of the Horde now, Kadsura spends her days attempting to not blow herself up with various potion creations and is, in fact, quite amused by the various people who seem to be under the mistaken impression that goblins want to destroy the environment. It’s quite the opposite, actually! Really, she just wants to hold the world together long enough to keep turning a profit.